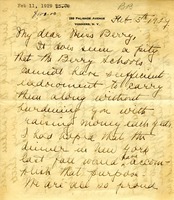 Adelaide M. Megeath writes to Martha Berry to donate $100 and commend her for the work she does at the schools. She also thanks Martha Berry for the cotton she received and informs her that her daughter Virginia got married and changed her name. She says that she has always wanted to visit the schools but has never been able to.